Many body parts begin to change as you age, and your eyes are no exception. One of the most common age-related eye changes is the development of cataracts. Although cataracts do not occur exclusively in older adults, they affect approximately half of all Americans by age 80. Cataracts occur when the lens of the eye becomes clouded. The lens is a flexible, clear structure of the eye that changes shape to reflect light onto the retina. This allows your eye to focus light rays, transforming visual signals into a clear, sharp image. As you get older, the tissue forming the lens grows less flexible, thicker, and less transparent. Slight degeneration of the tissue causes cloudy areas to form. As light passes through the lens, these cloudy areas scatter the rays and cause visual distortions. Many people report that having cataracts is like looking through a foggy windshield, as everything looks clouded. This can cause difficulties when driving, reading, and performing other everyday activities. Age-related cataracts are the most common, but other types may also develop. Cataracts are associated with eye injuries, exposure to radiation, smoking, diabetes, steroid use, and surgery for other eye conditions. Cataracts can also be congenital, causing some babies to be born with cataracts. Checking for cataracts is a routine part of your annual vision exam. Your eye care provider will test your visual acuity using an eye chart to determine if you have any visual impairment. The eye doctor may also use a bright light to view your cornea, lens, and iris to note any changes to their anatomy. Small areas of clouding are visible when performing this test. Your eye care provider may also dilate your eyes and examine your lens for signs of cataracts. In their early stages, cataracts may cause only minor visual impairment. Using brighter lights for reading or getting an anti-glare coating on your glasses for night driving may be adequate treatments in the early stages. As cataracts grow, however, they can severely impair vision. 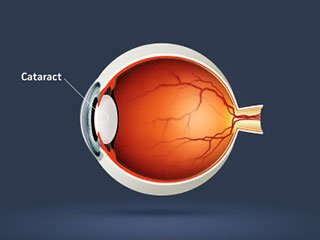 Your doctor may recommend cataract surgery, in which the clouded lens is removed and replaced with an artificial lens. Like all surgeries, cataract surgery carries some risk of infection or bleeding; however, it is considered a very safe surgery that is routinely performed worldwide. Clouded vision due to cataracts can be very impairing, so it is important to monitor your eye health. An annual optometry exam will detect changes to your lens that may be early indicators of cataract development.